Archie Gingold was born in 1908 in St. Paul to Lithuanian immigrants, and grew up in the nearby West 7th neighborhood. He attended St. Paul’s Mechanic Arts High School, went on to Macalester College, and ultimately graduated from the original St. Thomas Law School in 1932. (He was the last surviving alumnus of the original law school.) He was admitted to practice law in 1933. At one point he was hospitalized for an appendectomy, during which he was tended to by Nurse Helen Mae Swanson. She and Gingold were married in 1945, following his service in the Army. They had three daughters: Sandra, Carla, and Mimi. 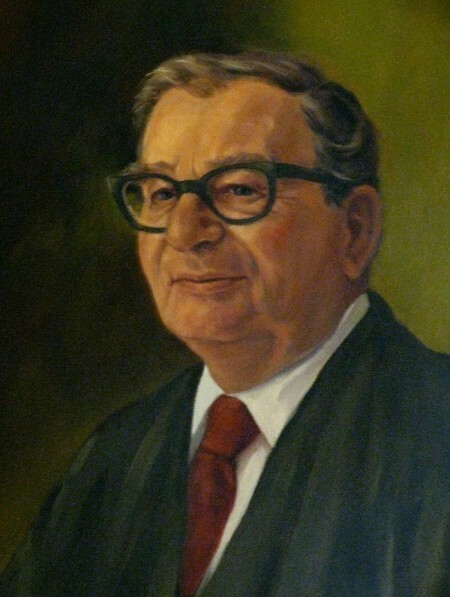 Gingold was appointed to the St. Paul Municipal Court in 1954, and then to the Ramsey County District Court in 1960. He spent the next 18 years serving in juvenile court. He was a stern but benevolent juvenile judge, known for pounding his fist and leaving the youngsters “shivering and shaking” before handing down light sentences. Other times he would remind offenders of the “bus for Red Wing” parked outside the court ready to take them away if they did not mend their ways. Adoption proceedings were his favorite, which he turned into courtroom celebrations featuring cake or cookies. He also changed how the court viewed alcoholics, seeing that they needed treatment for their problems before it was commonly recognized. He was also instrumental in developing temporary homes for children requiring out-of-home placement. He retired from the bench in 1978, but continued to serve the court in various capacities for the next ten years. Judge Gingold’s contributions to community and justice were recognized by many institutions. St. Thomas University Magazine published an article tribute to him, “Society’s Conscience” (1/07/2001). A special tribute was written of him by current Ramsey County District Judge John Van de North, which can be read here. He was active in organizations including the United Way, the Bethesda Foundation, the St. Paul-Ramsey Mental Health Board, and the Boys and Girls Clubs of St. Paul. He received awards for his efforts from Brandeis University, the Ramsey County Bar Association, Mount Zion Temple, Alcoholics Anonymous, Goodwill Industries, as well as an honorary Ph.D. from the University of St. Thomas Law School. Archie Gingold died in 2006 at the age of 97. The Law Librarian discovered abundant information regarding the late Honorable Gingold’s contributions to community and society, but knows that many people have fond personal memories of him. She invites readers to please share them in the comments box, as well as any other information they might have. It is an honor to read this blog about my father. A day doesn’t pass without some thought about the positive influence he had on so many citizens of Minnesota and on me personally. I used to pace the sidewalk with him as he contemplated how to best handle the challenging cases before him in the courts. It was as if each child before him were his own. I used to hear his speech rehearsals as he determined how best to convince the powers in authority to move the juvenile facility to downtown St. Paul where parents and services could best reach the children in detention. I used to listen to his wonderful stories of immigrant life in St. Paul at the Jefferson School. I am particularly thinking about my dad now as his grandson (my son) Adam Gingold Gerhardstein has graduated from his alma mater St. Thomas Law School and is relocating with his lovely wife to Cincinnati where he will join my husband Al Gerhardstein’s practice in civil rights. How lucky can a person be? I count my lucky stars that Archie Gingold was my father and remains my hero. Thanks for putting the blog up. I was blessed enough to be born as the second daughter of Archie Gingold and his wife, Helen. Everyday I feel his influence in some way. I appreciate the kind words that I hear about him. I recently ran into a woman who said that he “saved her life” by removing her from a very dysfunctional home and getting her into a group home. She was so thankful to him that she asked him to perform her marriage. It is also such a joy to see his wisdom and kindness carried on in his grandchildren.